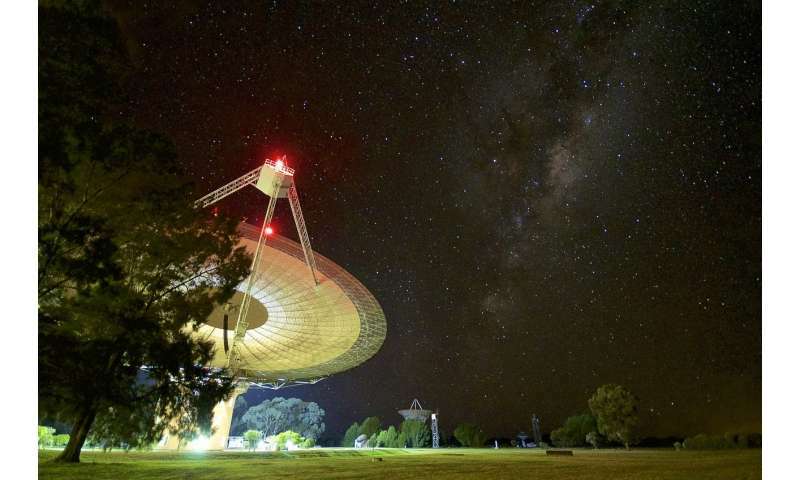 A team of researchers at the Parkes Observatory in NSW Australia has reported recording the brightest fast radio burst (FRB) yet on March 9 of this year. They describe it as having a high signal-to-noise ratio with an "orientation not very favorable for a detection of any gamma ray transient with INTEGRAL all-sky detectors." FRBs are millisecond bursts of radio waves that originate from unknown parts of space. The first known recorded event occurred in 2001, but it was not until 2007 that researchers noticed and verified it. Since that time, 32 more have been recorded, and all, save one, were one-time occurrences—the lone exception was found to repeat, and because of that, researchers were able to trace it back to an originating galaxy. The rest, unfortunately, remain a mystery, though most in the field suspect they are generated by cataclysmic events involving black holes or neutron stars. The record-breaking FRB came during a brief period in which three were recorded—all by the team at Parks—an earlier one occurred on March 1 and a later one on March 11. The team describes recording three FRBs in one month as quite "quite unusual," because they are normally very difficult to record due to their unpredictability—no one knows when or in which part of the sky one will occur. But that might change, as experts have suggested that FRBs likely occur every day, but are unnoticed because we do not have a telescope pointing at the target. Because of the limited number of recordings, space researchers know very little about them, though clues suggest some insight into their origin. For one thing, they all have a sweep in frequency, which suggests that they come from very far away—many billions of light years. That we are able to detect them after they traveled so far also reveals something else—the source must be incredibly bright, which hints at neutron stars or black holes experiencing some truly huge events. Most in the field expect many more sightings in the coming years as more teams try in earnest to record them. There is also optimism regarding their nature—many suspect that most if not all of them repeat—it is just a matter of being patient enough to wait for the next event from the same source. Could fast radio bursts be produced by collisions between neutron stars and asteroids? Article about the brightest FRB ever.. and nowhere does it talk about it's luminosity or compare it to other FRBs. This article is very poor on information. I suspect that the lack of data in the article reflects the lack of information available. After all, a one-time event sporadically observed isn't easy to get a luminosity on. But I could be wrong. Perhaps the data didn't seem germane to the article, which is after all just an abstract. @El Nose, the statistics are available at the links in the first paragraph of the article.